On a bad mood day, I see more ugly people than usual; my car is ugly, which is usually not a problem, since I couldn’t care less about a beautiful car; the dry winter scenes, which are normally architectural masterpieces, are just plain ugly and my bedroom mirror, which is most days a sweet and kind soul, shows its mean side. Today isn’t a bad day, so I couldn’t find anything ugly around me. Even the dishwasher and washing machine, fridge…all those machine-things have their beauty today, maybe because they still do their job so dutifully? I decided that garbage bins are my love-hate passion in life. Every day. They are not emotion-related. They are a cruel reality of life on earth. 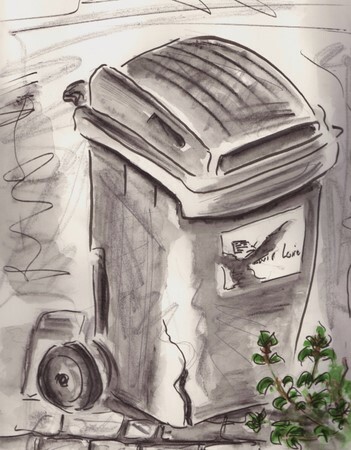 I hate every form of waste… energy, time, food, water, garbage…A Garbage bin to me, signifies the ugly side of life. But I couldn’t do without it. In shame I hang my head and I embrace my bins, glad I only have to fill them and someone else, more courageous then me, will take care of the problem elsewhere! So, here I give you the ugly side of my life and unfortunately, yours as well…. I wanted to depict these bins as ugly, so I gave only 5 minutes to myself to do each, wash included and I kept to it. I used Pentel brush pen and watercolor pencils; black….and red and green for a touch of beauty, since this isn’t a bad mood day…. Nice take on the subject and I amazed what you can do in 5 min. Your words are so RIGHT ON!!! And you made those can beautiful, my friend!!!! I may have to tag onto your idea … I am having a hard time with this challenge! Wow – nice sketches for 5 minutes!! Yes ugly but sentimental by necessity!! Fabulous, as always. I love this loose style. Great idea for the challenge – I too am having difficulty with it. I wish I could draw this well in 5 mins! But then maybe that’s why your sketches are so alive and vibrant? I like the little touches of colour in them. Wonderful choice of an “ugly” item. I agree with you about mood and ugliness….they do tend to go together. I like the gray tones in these drawing and the touches of color add something nice. You are right about the existential ickiness of garbage/waste. Ronell, I like what you wrote about this ‘ugly’ theme. I appreciate your honesty when you admit you see more ugly people when you are in the bad mood. I see your perspective of the trash bin as a symbol of waste and how it pertains to our life.Thank you for the thoughtful post and the accompanying pictures. 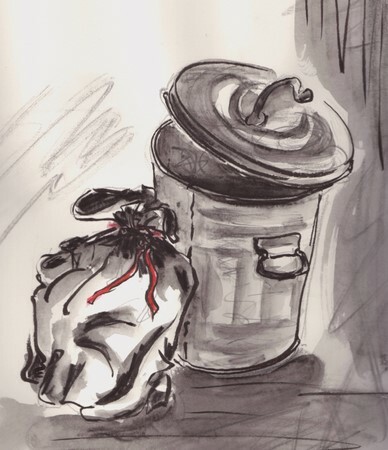 You tried to portray ugly, but you couldn’t help bringing some element of beauty in it … like the brilliant red of the trash bag tie, and the lush green foliage that slipped quietly in the corner. This post needs to be published! What a wonderful take on “trash to treasure!” You’ve made waste beautiful and given us so much to ponder as far as how our moods effect our outlook. Thanks! I thoroughly agree with everyone’s comments – this is a wonderful post, and you’ve made charming drawings out of a rather un-lovely object. I just love the touch of color. Beautiful work, Ronell. While I was doing this post, I thought how I would enjoy doing more “important”(by lack of better description) art, not pretty pictures, but art that touches, rises questions, thoughts, discussion, even controversy…but to do that, you have to be brave and a bit careless, I think, not worrying about hurting feelings all the time, like I do! I really liked your thoughts on ‘ugly’! And your drawings are amazing, I hope it doesn’t spoil it, but they’re really attractive bins! Hello. These are incredible, great obervation and take on the challenge! I so agree with your ideas about this challenge–I’m having such a hard time finding something “ugly” to draw. Your trash cans are beautiful! Really wonderful idea on “something ugly”. :)!! TOOO funny and what a great job with a great idea! Great interpretation of the theme and excellent sketches for the limited time allocation. Love those little hints of colour. Nice choice for the theme. I, too, hate wastefulness of any kind, and I think it’s worse when you can SEE it. 5 minutes? Wow, I am amazed what can be achieved in that amount of time. Well done! it’s perfect for ugly and sooooo well done.Love your little quick sketches also.